From the warm, tropical summers of KwaZulu-Natal’s coastline, to the cold, frosty winters of the province’s interior, there is a need for superior building products that are able to withstand both extremes while meeting customers’ ever-increasing demands for sustainability. Corobrik’s clay face brick range in wall construction has continued to prove itself in this realm, providing superior performing infrastructure with enhanced thermal efficiency that is both energy and cost efficient. A study the Thermal Performance of Australian Housing was published by Think Brick Australia’s research partners at The University of Newcastle following an eight-year research programme into the performance of clay brick. The research findings indicate that clay brick can improve thermal comfort of the interior, not only because of their insulative properties, but also because of the thermal mass of the brick. Thermal mass is essentially the ability of a material to absorb heat energy, with materials such as clay bricks requiring a lot of heat energy to change the temperature of the product. The appropriate use of thermal mass in construction makes a big difference to comfort and heating and cooling bills as less artificial temperature control is needed. The research shows that walling that incorporates thermal mass affords greater thermal comfort and energy efficiency than comparable lightweight walls. He said this is why Corobrik’s clay face brick range retains its popularity across the construction industry. One such example is the newly-constructed Shukela Training Centre (STC) student accommodation in Mount Edgecombe. 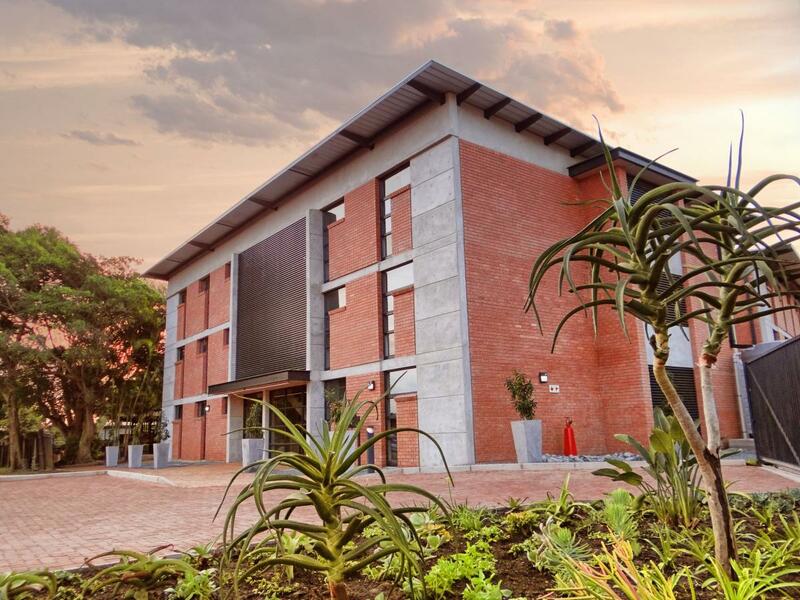 The three-story building, which consists of 86 rooms across the two blocks, was commissioned by South African Sugar Association (SASA) to accommodate the students who attend the STC - a subsidiary of SASA. Recently completed, the Sugar Mill Way facility proves the thermal capacity of the face bricks. For the STC building, architects from i3LAB, working with the contractor, 2C Projects, selected 73 000 Country Meadow Satin face bricks – used on the external façade of the building - with paving completed in Corobrik’s Cederberg 50mm pavers (17 000) and De Hoop red 73mm pavers (43 000). Shangase said that, in addition to humidity control, the bricks’ thermal efficiency meant they were able to moderate the temperatures experienced indoors as well. The architects at i3LAB were also able to achieve indoor temperature moderation using intelligent ventilation techniques throughout the building. The balcony, escape and main stairwells all have weather louvres to allow for cross-ventilation and bedroom doors are fitted with operable fan lights. The architects’ choice of cavity wall construction further enhances the thermal efficiency of the building. Corobrik’s De Hoop pavers were used in the parking area with the Cederberg pavers used for walkways, acting as a contrast between the building and parking areas. In addition to the aesthetics, skid-resistance and colour fastness of the clay pavers, Corobrik’s pavers – created from natural base materials – also have an amazing thermal efficiency that ensures they don’t overheat in the direct sun. The clay brick walling envelopes, which enhance thermal comfort and lower heating and cooling energy, result in a low lifecycle cost and, essentially a more sustainable option when it comes to building materials.